Installation of MS Outlook not mandatory for Conversion process. Software converts Emails, Tasks, Contacts, Calendar details and journal information in to PDF format. Microsoft Outlook is not mandatory to convert PST file data in PDF format. After scanning of PST File in PST to PDF converter. The user can preview all items, details of the different component of the PST files. 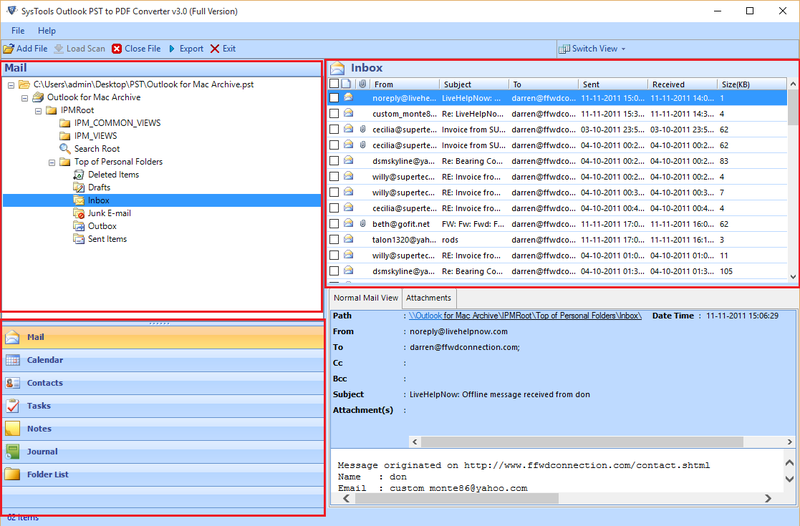 The user can view From, subject, to, Sent, Received, size and start, end, categories, created, Duration etc. 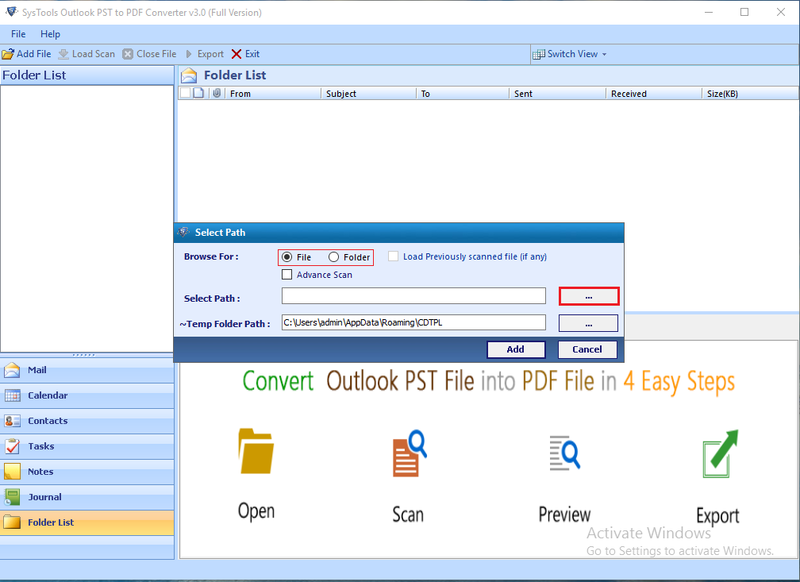 Outlook to PDF Converter software is designed in such a way that a novice user can easily manage to convert PST File into MBOX file format. The user interface has single panel, thereby provides simplicity in understanding the options for the conversion. Multiple naming convention options: With the help of software, a user can select desired naming convention from various naming convention options such as Subject +Date (DD-MM-YY), Date (MM-DD-YYYY) + Subject + from, etc. By default, each mail saves by "Subject ". Software Maintain Hierarchy of Folder storing PDF Files. During exportation, process tool does change original structure of the folder and not even meta data related to original information. By using, Date filter, a user can export messages in PDF format of specific dates, just selects the dates between them, user wants to export emails. Even user can use BAT Num option to maintain pages and can add a Date stamp to synchronize the resulted PDF File. Software Scan PST files before loading in the software. To scan minimum corrupted files, user can select the Quick Scan mode and for highly corrupted file, Advance-Scan should be preferred. The User can convert Emails of both ANSI & UNICODE PST file Format in PDF format. PST to PDF software compatible with both the formats of PST File. PST To PDF Software is a trustworthy tool to convert PST Files emails in PDF File Format. The software can export high-quality emails with attachments, embedded with it without installation of Microsoft Outlook. The user can change the emails File orientation, sizes, and margins before exporting them in PDF format. A PDF File format used all over the world for different purposes. This File format supports by various platform without any need of specific software. Even in forensic and legal work, documents are submitted in the PDF format only. Since information through pdf secured by many ways and even user can apply password on it. Sometimes a user needs to print emails of Outlook in the high-quality format for Personal, Corporate reason and prefer PDF Format of emails and to convert PST file into a portable document format, PST to PDF Converter can export Outlook emails PDF format with attachment and without any data loss. 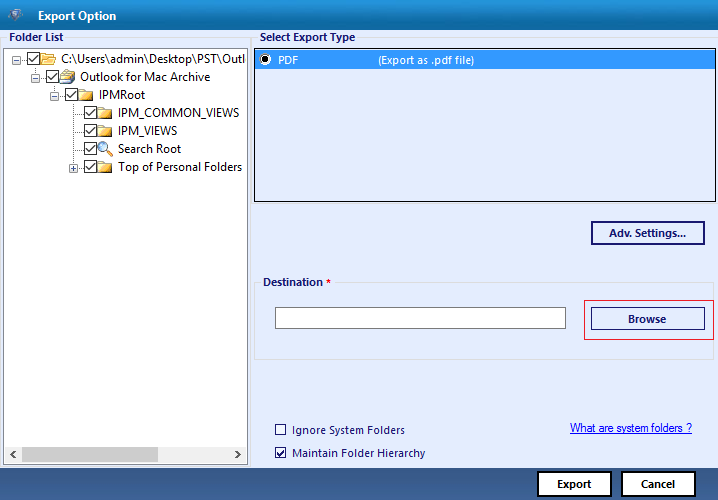 Browse the location of PST File in the local system. User can add Single PST File and Complete PST Folder. 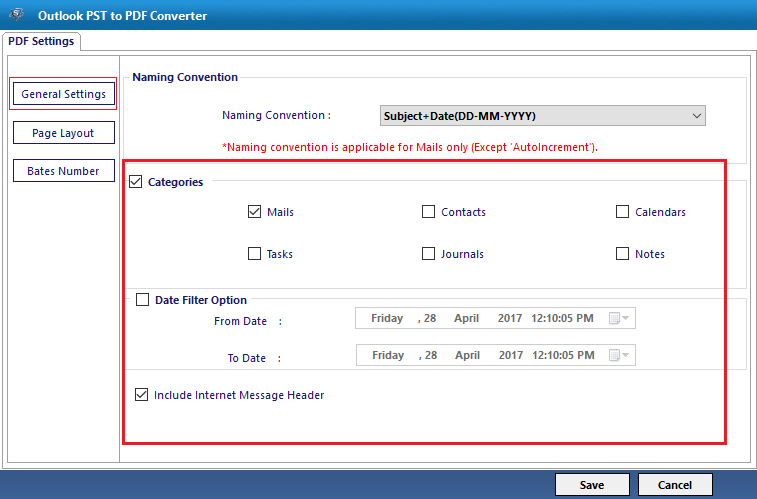 After Complete Scanning of File or Folder, PST to PDF Converter displays all Emails details stored in PST File using Mail section..
To Export Emails to PDF format, select the check box in front of messages and click on Export button. After selecting the Advance setting, Now navigate to Location Path, to save final PDF File in the configured system. 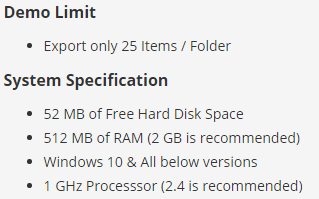 Click on "Export" option. PST to PDF Converter - Doubts & Queries! Is Software convert all attachment within emails? Yes, With the help of PST To PDF Software, user can converts emails, calendars, contacts, notes into PDF file format. It embeds the email attachments in their native format within the same PDF. Is software convert emails of corrupted PST files in PDF format? Yes, To scan corrupted PST file, Software provides two different modes such as Quick scan and Advance scan.. Does software support ANSI PST File? Yes, software supports both formats of PST file. Even it exports emails of the Orphan file in PDF format..
As a forensic expert, Mostly I submit the report in PDF Format for security reasons, Converter helps me a lot in this situation to convert email files in PDF format. Now, I can easily convert email file in the different format. 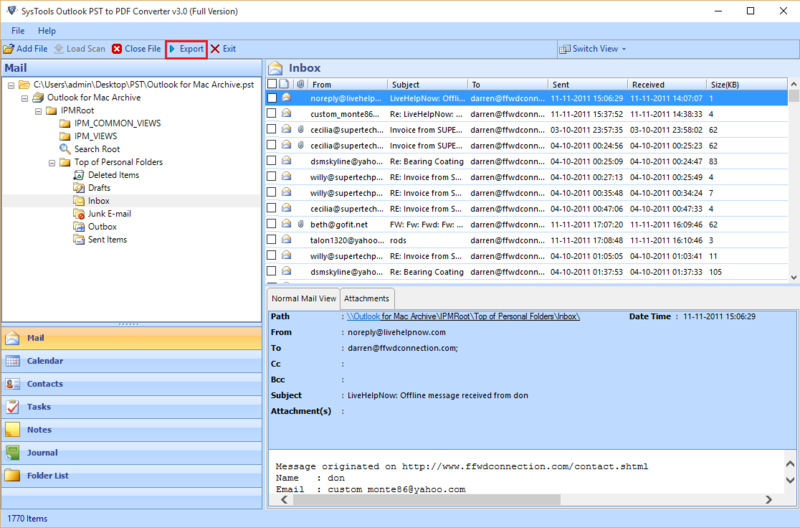 With the help of the Advance scanning option of software, now I can easily preview corrupted PST file items and export single or multiple emails in a single conversion process. As the PDF file format is the best way to secure way to preserve email files and other documents. 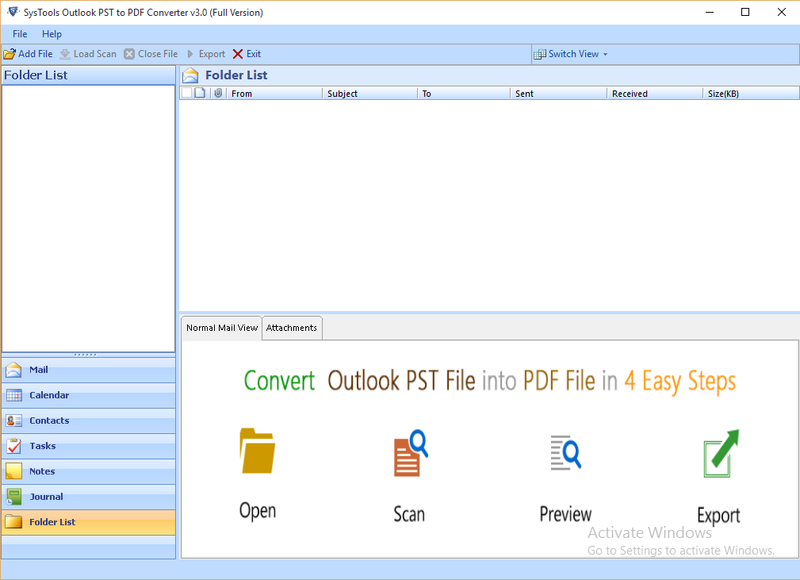 I trust PST to PDF converter tools that convert my Outlook email files quickly and safely.